I only eat veggies, but run like my meat eating friends! Traveling for two weeks really threw off my training plan, especially when I was hanging out with my friends. This week I really want to focus on staying on track and maybe throwing in a few extra miles. Don’t forget to register for my giveaway on July 30th! One thing that was nice about being out of Baltimore the past two weeks was the lower humidity. Today the humidity was up near 45% and the temp climbed to 93 degrees. The weather report said the heat index was between 103-105. In the interest of my health and wellness, I decided to focus on hydrating throughout the day and run in the evening after the sun started to go down. I convinced one of my running friends to join me and she convinced her brother to come as well. I say convinced because I think she was leaning towards running on the treadmill rather than outside. We met at her house ran down to the promenade on Boston St. through Fells Point and back. The air was thick and the sweat was pouring off of us. Our pace was a bit slower than we normally run, but we got the miles in. Sometimes you need to adjust for the weather and make sure you are safe when you run! 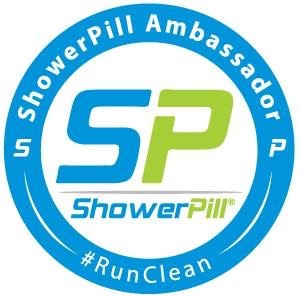 My plan today was to run with Tin Roof Runners, they usually run between 3-5 miles, but I needed to run a bit further to stay on track with my training plan. Though I did add a few extra miles yesterday. I decided to take an Uber to run club and get out early and run a few miles before running with the group. I had the Uber drop me off in Highlandtown about 2 miles away and I ran to Tin Roof in Power Plant Live. It was a good warm up before running with the group. The weather was humid as usual and I think that kept people from coming out to run club, but a few people showed. We ran a loop through Fells Point, Canton, Patterson Park, and back to Power Plant Live. It was a good run and nice to be running in my hometown after 2 weeks away! I decided to bike to run club tonight, it is about 6 miles each way, a nice warm up before hitting the streets. I added a few more miles today, even though it is still early in my training and it probably won’t matter, I feel like I need to make up the miles I missed last week. I ran with City Sports Run Club tonight! That is where I started running about 2.5 years ago; a TomTom rep was there and raffeling off a TomTom Runner Cardio. To enter the raffle you had to demo the watch. The rep who I have known for a while now, joked that I could wear my Garmin 220 on one arm and then TomTom on the other. I opted to just run with the TomTom. It was a little bit bigger, and only had one button on the wristband, it also had a heart rate monitor built in. Overall I liked the Runner Cardio, but I’ll stick with my Garmin. Had I won the watch I may have been swayed! One of the reps I didn’t know also ran with us, he only ran a 1/4 mile with us and then stopped. We ran around the city through the Harbor, Locust Point, Fed Hill, and back. After the run, when we got back to the store he informed us he had a heart attack about 3 weeks ago. I was amazing he was even able to run that much, the body is an amazing thing! Due to some other committments I had to run in the late afternoon today, probably the hottest part of the day, though it wasn’t as hot as it has been the last few days. I was sore from earlier in the week and hitting the links earlier in the week. I decided to switch my tempo run today and do it Friday with November Project. I got my new shoes in the mail, and decided a short run would be a good start to breaking them in. I ordered Brooks Glycerin 12’s Ombre collection. 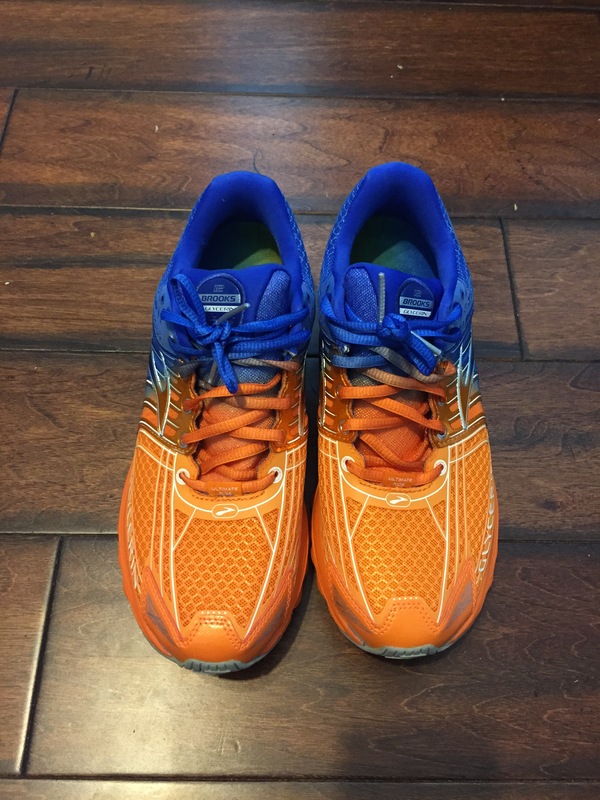 I’ve ran in Brooks for the last 2 years, same shoe, same color, either orange or the ombre (blue/orange). When I find something I like I stick with it! After adjusting the laces the way I like I took a loop around the neighborhood and kept the run streak alive! 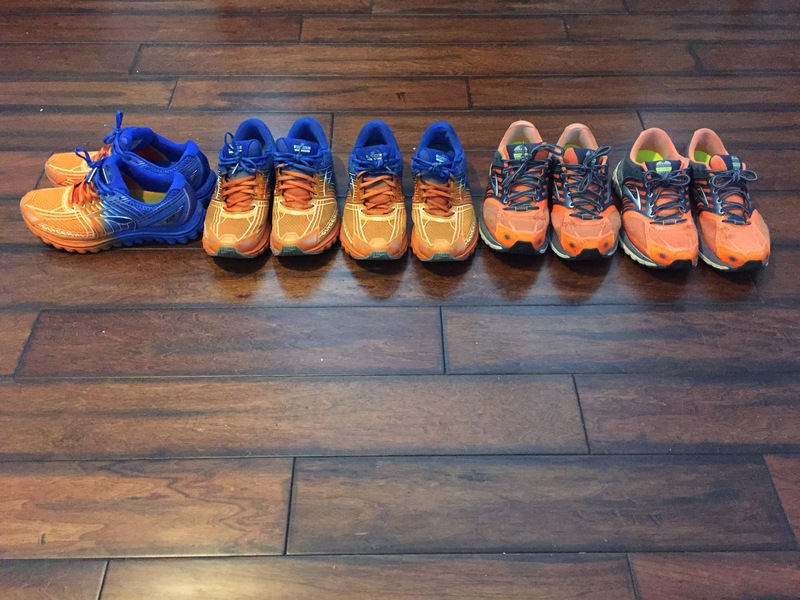 2 Years of Running Shoes; when I find something I like I stick with it! Well I didn’t get to run with Sarah and FKBT when I was in Providence so I figured I would go to November Project this week and run with Sarah and hear about her half marathon. I decided to work in some cross training again and rode my bike to NP, it was about 4 miles each way. This week I was suppose to do 5 X 800 intervals, but I decided that hills would be just as good. The training plan does say you can swap workouts if the race course is hilly and Baltimore is a hilly course, especially the second half. NP always runs hills on Friday and it just so happens the hill they run is about 800 meters, so it worked out perfectly. I still tried to sprint when I could but the hill is a 5% incline and by the 3rd one I was feeling it. On the second ascent I could see a person walking dogs near the top of the hill but I didn’t see a leash so I assumed they were off leash. You know what they say about assuming. As I turned the corner at the top of the hill I felt something pull hard across my stomach, it was one of those retractable leashes. I’m not sure who I pulled more the dog or the owner. He immediately started apologizing. I decided not to respond at all, because what I would have said would not have been nice. I pushed the leash over my head and went on my way. The 5th hill I was struggling but I still gave it my all, when I finished I was thinking about trying to run that little extra to get to 5 miles but my legs were spent and I still needed to ride my bike home. You can always count on a good workout with November Project! Seven Miles on tired legs, tired from the hills the day before and just in general tired. Today marked 9 months of my run streak, I’ve ran everyday for 9 months, it is even a little hard for me to believe. When I started out I wasn’t sure how long I could keep the streak up, so far I’m really happy with how it is going! These 7 miles were suppose to be at race pace, but I just wanted to get them in; when I started I wasn’t even sure I if I had 7 miles in my legs today. Furthermore 8:14 might be my race pace, though I’m hoping it will be slightly faster, only time will tell. I ran the peninsula around my house, the evening air was warm but tolerable. I had a negative split on each half and I picked up the pace the last 2 miles, the last mile was actually my fastest at 7:56, which made me happy. I felt much better after I got the miles in, funny how it always works out that way. I’m not looking forward to the 10 miles tomorrow. I see now why the training plan has the day of rest between hills and the next two days of running…oops. I tried something I’ve never done on a training run before; a point to point run. I decided to run in the city, so I took an Uber to the Korean War Memorial and went from there, not really knowing where I would end up. 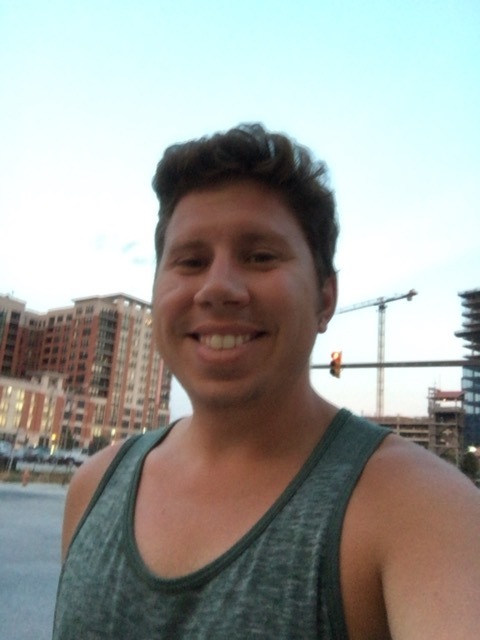 I decided to run along the waterfront for a while, when I got to the harbor I ran up Pratt St. From there I looped both stadiums and headed towards Ft. McHenry, I made another detour ran around a park, not really sure of the name and then looped the Under Armor factory and that made 10 miles. I was pretty happy with my pace, I was trying to run slower which is sometimes hard for me when I run by myself. I was trying to focus on just logging the miles instead of the speed. Yesterday I was dreading running, today I enjoyed each mile and the scenery. It got me thinking does it matter where you run? I think it does, I enjoy running more in the city than I do my own neighborhood. I think it is because of the people, scenery, and other runners in the city. Another week of training in the books! Your weekly mileage is really getting up there!! I can’t believe you did 5 hills on Friday. You were flying. I was definitely struggling still ha. Alsooo we missed you biking Saturday! Darrell said you were coming and then he showed up without you. I figured you’d be doing your long run buttt we had donuts at the end. On Friday I knew if I stopped to do the exercises I wouldn’t be able to do 5. Sorry I couldn’t make it Saturday Donuts, yum!